The diversity and richness of Jerusalem, both in terms of it's cooks and their disparate backgrounds and the ingredients they use, make it fascinating to any outsider. But what makes it doubly exciting is the emotional and spiritual energy that this city is drenched in. When it comes to people's emotions it is hard to overstate how unique it is as a city. For a cookbook aficionado I have been quote neglectful, irresponsible one might say. There is one cookbook author who has been releasing best selling cookbooks for nearly a decade. His books are even cultural just the way I like them and yet I have been in recklessly nonchalant in my attitude towards them. I have skimmed past his books on the shelves hundreds of times without ever purchasing. It may be that they are so popular they are never ever discounted or it may be a bit of the tall poppy syndrome we are so well known for here in Australia. How good could his books really be? Well I have begun to answer that question with the purchase of the 2012 cookbook Jerusalem and surprise surprise it is everything one could hope for in a cultural cookbook. It is personal in ways I have never seen in a cookbook. It takes you on a journey through the authors past and present using food as a window into a complex city that is impossible for outsiders to understand. It opens a door to a nation that you rarely see depicted in any other way than through it's struggles and unrest. It highlights shared connections with neighboring countries as well as shedding light on their differences. It is a raw and real insight that is so rare in these days of social media. The food in the book is intertwined with religion and political issues just as they are in reality and it is one of the most honest accounts you will read of life inside the city of Jerusalem. The photography is just as honest as the recipes and stories. The images depict every day life in the city, people doing every day things, eating and cooking the food they eat and cook everyday. There are shots of supermarket shelves, people eating in restaurants with decaying walls, expansive outdoor markets, letterboxes, babies and their mothers, men socialising on the streets, set dinner tables, bakers, vendors and food food food. It is such a clever insight, it is life in the city minus the filters. From a cooks perspective it is a book that is so usable you will want to cook everything from it. Nothing seems daunting or over wrought. Each recipe has an introduction that draws you into the story or history behind each dish. The ingredients are all readily available, which may be by design when written with the western cook in mind or it may be that the primary ingredients used in the middle east are common in the west. I suspect a little of both. This book gives me the sense that Yotam and his co-author Sammi are savvy chefs. They have presented a selection of recipes that are a mix of traditional to the region as well as "inspired by" the flavours they grew up with. It is a blend of recipes that are approachable by the home cook, a set of recipes that will make you unsure which to start with as they all read in a manner that you know are achievable in your own kitchen. That is actually quite rare in a cookbook. Many times I sit down with a selection of books, skim through and start thinking, "oh I can't get that ingredient around here" or "that recipe is too complex or time consuming for a Sunday night dinner". It can be frustrating and I strongly believe much of that comes down to the presentation of a recipe. You need the intro to each section of the book as well as each recipe to demystify what it is your cooking and why. Yotam really takes you by the hand a walks you through the dishes, explaining each in detail to break down any barriers you may have to cooking the recipes. There is a strong voice to this book that carriers through from page to page creating a cohesion that makes you feel at one with the author. Even the method's for each recipe impart that voice, as if Yotam is there in the kitchen showing you how to cook his dishes, what to look out for when cooking and even how to plate the dishes. It is quite remarkable that a person can have such a strong presence in written form. As I cook recipes like 'Hummus Kawarma with Lemon Sauce' and 'Basmati and Wild Rice with Chickpeas, Currents and Herbs' it is an awakening. An awakening to a vibrant cuisine that takes everyday ingredients we have all used time and again and melds them into something new and exciting. The latter mentioned rice dish was unlike anything I had eaten taking fresh herbs like parsley, dill and coriander and mixing them through a blend of rices and currents and topped with crunchy fried onion. I can see it going into my dinner party repertoire to be cooked many more times in the future. 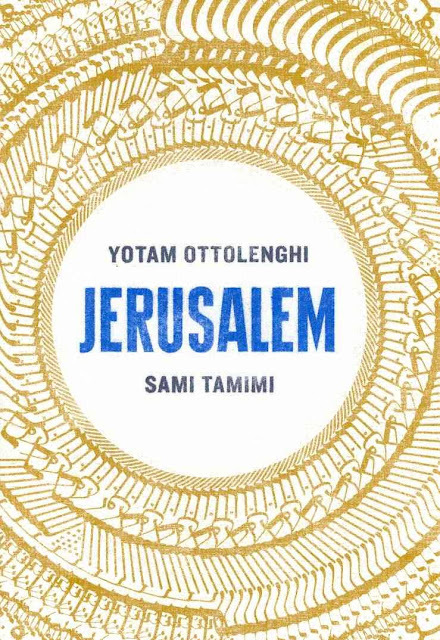 Yotam's catalogue of cookbooks seems to be growing fast and if Jerusalem is anything to go on I am excited to try them all out in time.